Both Nguyen Thi Dinh school and Nguyen Minh Hoang school have had excellent performance to play in the finals. Nguyen Thi Dinh was higher- examined because of its more qualified players, however Nguyen Thi Dinh had a goal against soon. 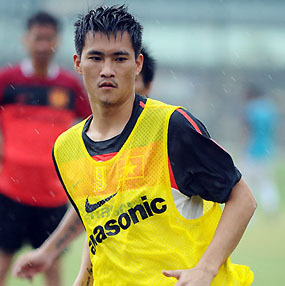 Pham Thanh Quy opened for Nguyen Minh Hoang school in 8th minute. Nevertheless, Nguyen Minh Hoang players’ joyment couldn’t last long. 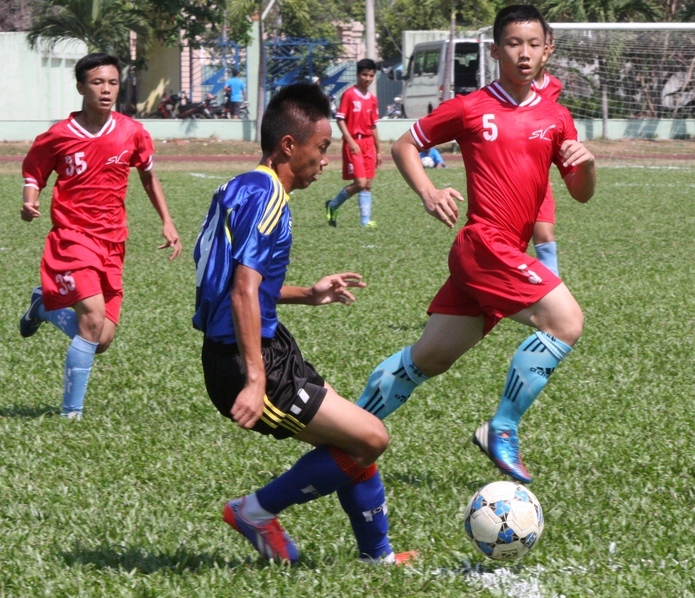 From a mistake of goalkeeper Tien Dat, Nguyen Thi Dinh school has an equalizing. Before the first half ended, Nguyen Thi Dinh’s Thanh Hau had scored one more goal in 26th minute. Entering the second game, Nguyen Minh Hoang players increased speed, they many times put pressure under opponents’ goal. 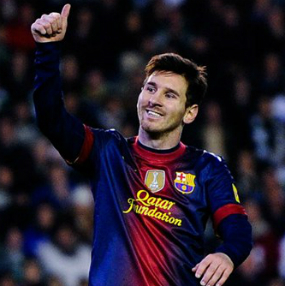 However, no goal was scored successfully. 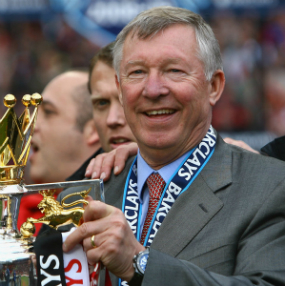 Then, Nguyen Minh Hoang school had to suffer a goal against. In the last 5 minutes of game, Nguyen Thi Dinh school receive a penalty shoot because defender of Nguyen Minh Hoang school’s fault in penalty area. Striker Van Xuan excellently set 3-1 win for Nguyen Thi Dinh. 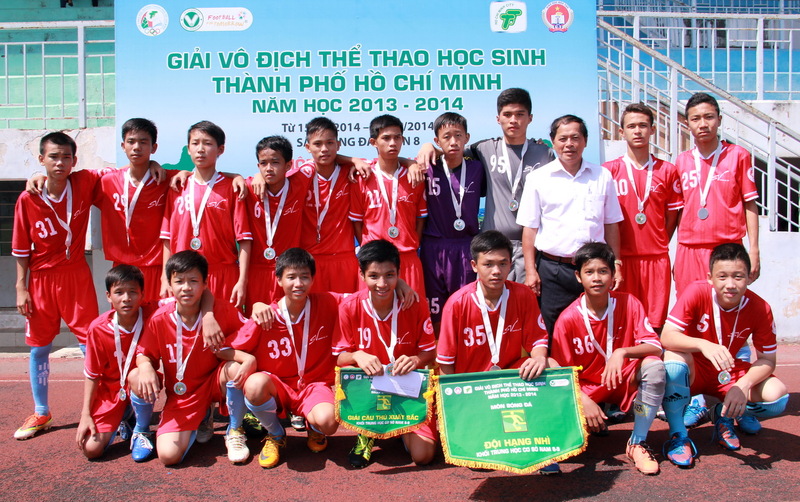 Then Nguyen Thi Dinh school won the champions of Ho Chi Minh City secondary school Football tournament- Grade 8-9 2014. 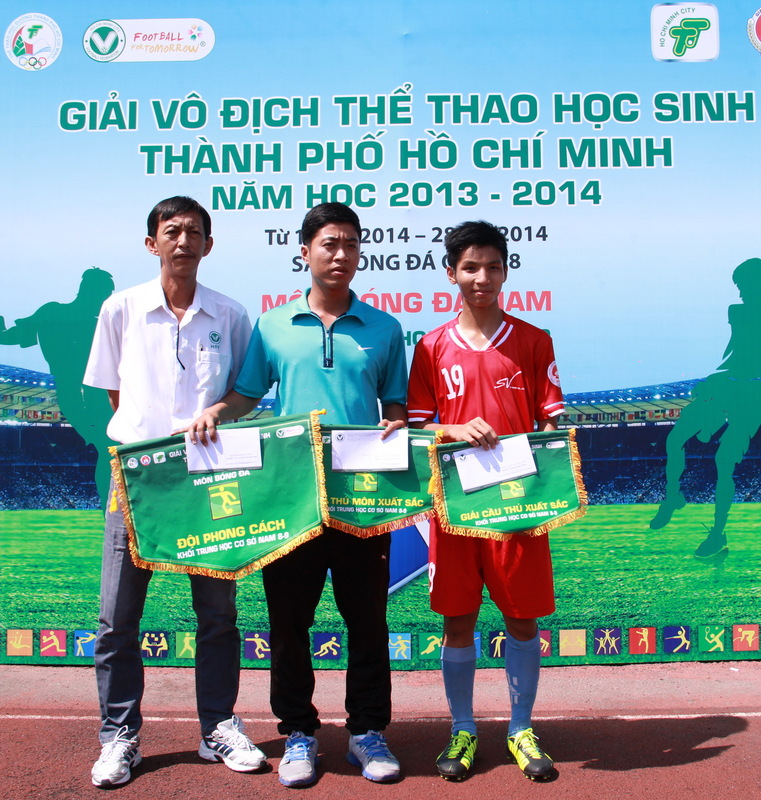 In the closing ceremony, goalkeeper Tran Ngoc Hoan ( Bong Sao A school) was presented the best goalkeeper prize. Pham Thanh Huy ( Nguyen Minh Hoang school) received the best player prize and prize of playing style was given Bong Sao A school.